The Wade Crossing Apartment Homes have a pet-friendly policy. There are no restrictions in terms of the number of pets you can keep in the apartment. Therefore, if you have a pet or a dog who is a part of your family, they have the benefit of enjoying the comforts of the apartments alongside you. If you had trouble finding a suitable home with a Dallas apartment locator and are interested in Wade Crossing Apartments, please contact us today on 972-418-0066. The very opportunity to live in the affluent city known of Frisco is enough of a reason why the Wade Crossing Apartment Homes defy all odds and fulfill your luxury needs. The apartments are located in central Frisco and are minutes away from some of the most well-known attractions and popular sites. Among these include the Frisco Assisted Living Center, Tuscany Square, Sprouts Farmers Market, and the Frisco Athletic Center. You will be captivated by the various activities you can enjoy on weekends whether it is eating out at fancy restaurants or enjoying shopping in one of the best malls and markets in the area. The apartments are available in one, two, and three bedrooms coupled with splendid interiors. You will have your own private balcony or patio depending on what bedroom apartment you choose along with modern equipped kitchens and considerable living space that will be ideal for inviting friends and family over. The apartments are also furnished with comfortable and quality furniture including but not limited to sofas, television, carpets, and lighting. Furthermore, you will have a private den or study area, a fireplace area, Wi-Fi internet access, and detached garages. In addition to these, you will have the privilege of taking benefit from various recreational facilities, such as a 24-hour gymnasium and swimming pool. The Wade Crossing Apartment Homes have a pet-friendly policy. There are no restrictions in terms of the number of pets you can keep in the apartment. Therefore, if you have a pet or a dog who is a part of your family, they have the benefit of enjoying the comforts of the apartments alongside you. 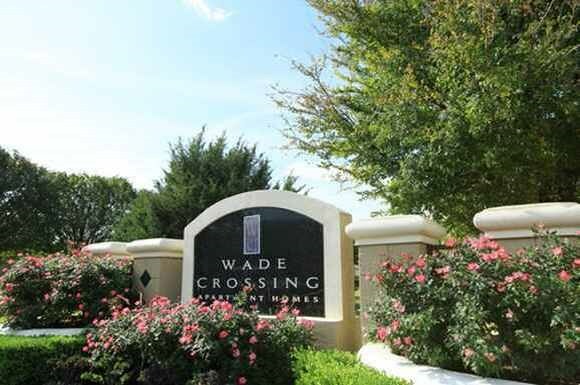 If you had trouble finding a suitable home with a Dallas apartment locator and are interested in Wade Crossing Apartments, please contact us today on 972-418-0066.